GLAD is proud to partner with Ropes & Gray and MTPC on the Pop-Up ID Project. 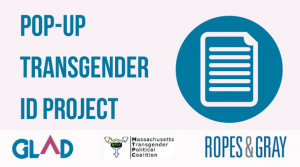 This critical initiative provides free legal representation through a rapid-response program to transgender people who need help changing their legal name and gender on federal and state documents. And your partners at GLAD are proud to have your financial support for their Transgender Rights Project – now more than ever. Affirming LGBTQ youth and elders, fighting for transgender rights, ending discrimination against people with HIV, and protecting LGBTQ relationships, parents, and families — these are just a few of the ways your support moves equality forward for all. Yes! I want to support LGBTQ justice! Join the Ropes & Gray team in meeting our goal of $20,000! $3,110 raised already! Become a member of GLAD’s Equal Justice Council with a gift of $1,500 a year ($125 per month) or more and receive exclusive benefits such as invitations to special events and complimentary tickets to our annual Summer Party.